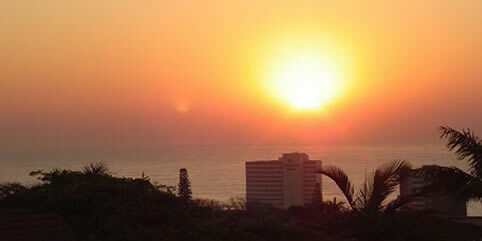 Crooked Tree Cottage provides luxury accommodation in Umhlanga Rocks, just north of Durban. Both Bed and Breakfast and Self Catering Accommodation options are available. The accommodation gets its name from the lovely, crooked tree that drapes over the cottage as well as other parts of the garden. Your hosts, Helen and Reinhard Oehler, live on the property and their friendly attitude combined with great personal service will ensure your stay at the Crooked Tree Cottage is a memorable and enjoyable one. Crooked Tree Cottage has three rooms and a Studio Suite. These can be rented out on a Bed and Breakfast or Self catering self catering basis. The Cottage has a well equipped kitchen and dining room/lounge area. The lounge area opens onto balcony with magnificent sea views. A deck area at the front of the cottage is available for barbeques and sundowners. Three beautiful rooms can accommodate six people, all have en suite facilities. Main Room: King size/twin bed, is en suite and has a sea view. Room 2: Double bed, en suite shower, sea facing. Room 3: Double bed, en suite shower over bath, private entrance. The Studio Suite is separate from the main cottage and has its own entrance. This unit opens onto the swimming pool. The main room has a king size bed that can be split into two singles. For additional guests there is a double sleeper couch. An equipped kitchen means this is perfect for those who want self catering accommodation.